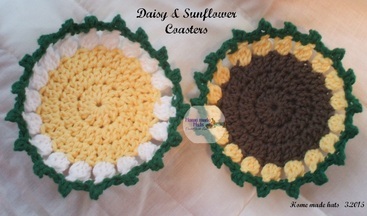 These patterns are for the coaster and place mat. They are easy to make and can be done in any color you wish. Perfect for you luncheon table. To make Puff Stitch - y/o insert hook in stitch, *y/o pull up loop, y/o pull two (2) loops off hook, repeat from * two (2) times more, y/o pull off all four (4) loops on hook. This completes the 3dctog puff stitch. To make Picot - single crochet (sc) chain 3, slip stitch (ss) in 3rd chain from hook picot complete. Rnd 4 - ch 2, make 3dctog PS in same st as join, *chain 2, skip next stitch, PS in next, repeat from * around (18 PS, 18 ch 2 spaces). Join in top of ch 2. Rnd 5 - ch 1, sc picot in same stitch as join, *sc in ch 2 space, sc picot in next stitch, repeat from * around. Fasten off, weave in ends. To make Puff Stitch - *y/o insert hook in stitch, y/o pull up a loop, y/o pull two (2) loops off hook, repeat from * four (4) more times, y/o pull through six (6) loops on hook. This completes the Puff Stitch. To Begin: With Taupe, Make Magic Ring or chain 3, 12 dc in ring or third chain from hook (12 dc), join with slip stitch in first dc. Rnd 2 - Chain 2, 2 dc in same stitch as join and each stitch around (24 dc), join with ss. Rnd 3 - chain 2, 2 dc in same stitch as join, *dc in next stitch, 2 dc in next stitch, repeat from * around (36 dc) join. Rnd 4 - chain 2, 2 dc in same stitch as join, *dc in next 2 stitches, 2 dc in next stitch, repeat from * around (48 dc) join. Rnd 8 - chain 2, make PS in each chain 2 space around, join with ss. 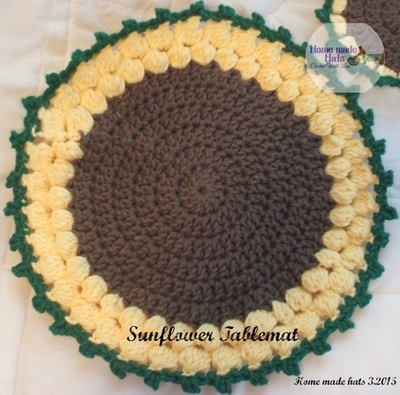 To make Daisy Table Mat substitute Taupe cotton for White. Questions about this pattern?? You can contact Cheryl at homemadehats121@gmail.com with any inquiries.